FACT CHECK: Is Worm Meat Used in McDonald's Hamburgers? Worm Meat Used in McDonald’s Hamburgers? Does McDonald's use worm meat as filler in their hamburgers? 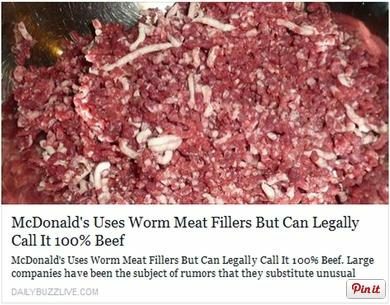 McDonald’s Uses Worm Meat Fillers But Can Legally Call It 100% Beef. 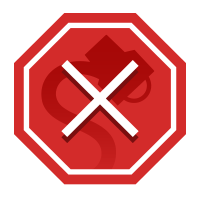 Large companies have been the subject of rumors that they substitute unusual or unethical substances in their products, usually to decrease costs. McDonald’s is not immune to such claims. McDonald’s has been accused of using everything from worms to cow eyeballs in its burgers. Dating far back to at least 1978, there have been rumors that McDonald’s restaurants use earthworms in their hamburgers. McDonald’s then ships the beef to their grinding facility in Oak Brook, Illinois where they then take the ground worm filler and add it to their “100% beef patties”. McDonald’s serves billions of people around the world every year. This allows them to produce a higher profit margin by increasing the amount of patties that can be made, by increasing their product load with the worm filler. The worm filler is ground and packaged in a facility next to McDonald’s corporate headquarters in Oak Brook, Illinois. The employees must sign a confidentiality waiver to never discuss the ingredients of the McDonald’s food products or face termination and legal repercussions. However many employees have stepped up over the years with the truth and have created a huge controversy over the quality of food that the company produces. Toward the end of the summer of 1978, my mother-in-law said she had heard a new rumor about a hamburger chain: A story going around Chattanooga, Tennesse, alleged that Wendy’s put red worms in their hamburgers! Contamination rumors are fairly common occurrences in the food and beverage industries. They often sound silly and seem merely bothersome, but they can be devastating, as Wendy’s well knew. The first inquiring phone call was made to Wendy’s on August 15th. The caller said that the worm story had appeared on the television program 20/20. As the calls poured in, however, the name of the television program involved changed from week to week. Sometimes it was 20/20, sometimes 60 Minutes. Very early in this rumor series, a woman called Wendy’s main office to say that her husband saw a program (20/20) on which appeared representatives from Wendy’s and McDonald’s hamburger chains. The Wendy’s people, she said, admitted to putting worms in their hamburgers, but the McDonald’s spokesmen were noncommittal. Wendy’s was the main target of the worm rumor, with McDonald’s, Burger Chef, and Burger King named from time to time. After Labor Day, the Wendy’s worm rumors became even stronger in the Chattanooga area and included adjoining parts of Georgia. One whole section of Atlanta was affected. In desperation, Wendy’s Chattanooga people demanded that the head office do something. Steve Samons of Wendy’s decided to go public, while Doug Timberlake of McDonald’s opted to “lie in the weeds” and see how Wendy’s made out. A television newx conference was scheduled for September 15th. It was to feature a representative of the government meat inspection office in that region who would point out that nothing was added to the ground beef at Wendy’s or at any other fast-food chain. For some reason, he did not show up, so the production became exclusively Wendy’s, who denied all and made statements to exonerate themselves. After that effort, they were never again part of the rumor scene. From then on the rumor involved McDonald’s. It spread out from Chattanooga and for a while seemed to follow Interstate 75, over to Atlanta, up to Ohio. Doug Timberlake said that when it reached Indiana and Ohio, it really flared up. It was decided to hold a press conference in Atlanta. Timberlake was aware that “going public” would make many people aware of the rumor who had never heard it before. Public relations people often are leery of talking directly about a rumor problem or referring to rumors even indirectly, because they believe that such tactics spread rumor even more. On the other hand, an emphatic public statement possibly could immunize people from the effects of the rumor when they did hear it, as well as set the record straight for those who had already heard it. On November 23rd a national press conference was held in Atlanta in which the rumor about “protein additives” was denied. The “100% U.S. Government-inspected beef” position was re-asserted, and of course the word “worm” was never mentioned. A follow-up nationwide advertising campaign was launched in which color photographs of the product, with captions, celebrated its pure, uncontaminated ingredients. The “extinguishers” went into effect, and shortly thereafter the rumor was quenched. The experience of one owner of four McDonald’s franchises in Atlanta, Georgia, was typical. Back in 1978, he saw his sales plunge by 30 percent and consequently had to lay off about a third of his employees. Corporate rumors aren’t victimless. In April 2014 and again in November 2017, the “worm burger” rumors were revived when the faux news site Daily Buzz Live published an article (reproduced above) recycling that and several other old McDonald’s-related urban legends, accompanied by an unrelated photograph of ground beef mixed with pats of frozen butter that coincidentally resemble worms. For the record, not only is the worm additive rumor untrue, but McDonald’s also does not purchase and use cow eyeballs, skirt the law by buying adulterated meat from a company misleadingly named “100% Beef,” or put yucky stuff like styrofoam balls and feathers in their milkshakes. The [London] Times. 30 April 1992 (Features). The Vanishing Hitchhiker. New York: W. W. Norton, 1981. ISBN 0-393-95169-3 (p. 90). Tales, Rumors and Gossip. Englewood: Libraries Unlimited, 1996. ISBN 1-56308-190-3 (p. 152). Rumor in the Marketplace. Dover, MA: Auburn House, 1985. ISBN 0-86569-117-7 (pp. 14-17). Morgan, Hal and Kerry Tucker. Rumor! New York: Penguin Books, 1984. ISBN 0-14-007036-2 (pp. 70-71). “A Wormburger Scare.” 27 November 1978 (p. 90). The Big Book of Urban Legends. New York: Paradox Press, 1994. ISBN 1-56389-165-4 (p. 174).